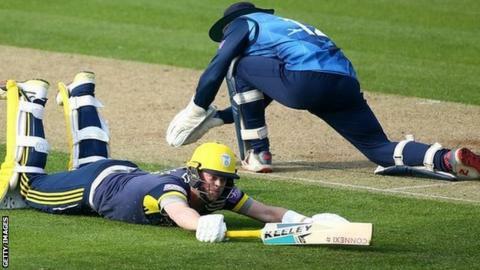 Former Kent captain Sam Northeast hit an unbeaten century to help Hampshire to a 90-run One-Day Cup victory. In a repeat of last year's Lord's final, won by Hampshire by 61 runs, the visitors won even more comfortably in Canterbury after posting 310-9. Northeast was the hundred-maker this time with 105, well supported by half-centuries from James Vince (56) and Lord's centurion Rilee Rossouw (55). Kent never looked comfortable under the lights, falling well short on 220. Their reply was always doomed after crucially misfiring with the loss of three wickets inside the first six overs. Daniel Bell-Drummond was caught off a leading edge at cover off Kyle Abbott, then Australian Matt Renshaw was caught behind on his home debut. And, just six balls later, Heino Kuhn, Kent's top One-Day Cup run scorer last season with 696 runs at an average of 87, was unluckily out for a duck after facing just two balls when Abbott deflected a Zak Crawley drive onto the stumps to run out the stand-in skipper at the non-striker's end. Northeast, who left Canterbury for Southampton at the end of the 2017 season, is yet to lose his wicket in two One-Day Cup meetings with his old county Kent. He was also not out in last year's final, making 75, when he was booed by Kent supporters. But he did play Kent twice in the T20 Blast and was out first ball each time. "Our batters at eight, nine and 10 showed there were runs to be made on this wicket had we have put down better foundations. "Maybe we didn't have the best of luck, but we needed to prolong things a little more with the bat early on. We needed to build pressure then take it deep. We weren't unable to do that. "Credit to them because they batted well. Sam, Rille and James all played superbly to make sure it wasn't our day. There are positives to be had with Matt Milnes' five-for and Fred Klaassen bowled well at the death in his first game for us. Harry Podmore bowled well and then hit the ball sweetly for his 40." "We played well without ever being right on our A game. It was important to get 300. We felt that was a par score on a really good wicket. "I paced my innings really well, but guys came in and made my life really easy by playing aggressive cricket from ball one. When Rilee and I were in it felt like we'd pushed the button. "It was nice to get a good reception from the fans here this time. It was home to me for so many years and felt nice to come back and see so many faces and to walk out to no boos."